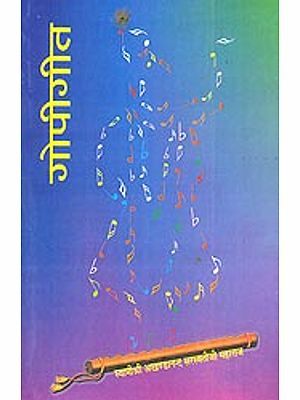 The celebrated Sanskrit classic of India reveals the purpose if human life and the nature of pure spiritual love. 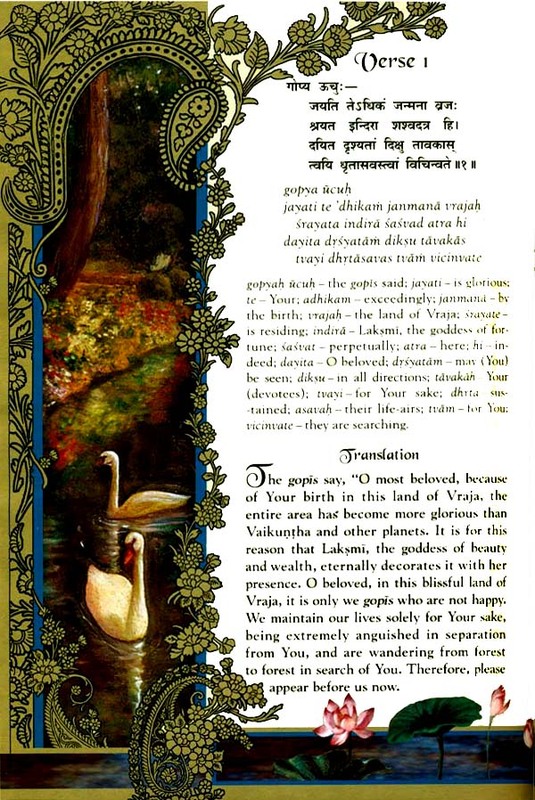 Its divine poetry was originally sung by the young cowherd-maidens (gopis) of Vraja to their beloved Sri Krsna, God Himself, while searching for Him in the autumn moonlight on the banks of the sacred river Yamuna. Concealing Himself from their sight, he listened in adoration and wonder to their expression of amorous love for him. This exquisite and authoritative edition of Gopi-gita is yet another of Sri Srimad Bhaktivedanta Narayana Gosvami Maharaja?s invaluable gifts to humanity. Enlightening and thought-provoking, it illuminated the gloried of the transcendental maidens of Vraja, and especially of Srimati Radharani the Supreme Feminine Personality and the embodiment of the supreme lord Sri Krsna?s pleasure potency. Sri Srimad Bhaktivedanta Narayana Gosvami Maharaja is the greatest living authority on the philosophy culture, and practices of Bhakti-yoga in the Gaudiya Vaisnava tradition. A bold spiritual leader and prolific translator and commentator of the ancient Vedic literatures, he is recognized as a pure devotee of Lord Krsna in the line of Sri Caitanya Mahaprabhu, and a firm follower of the Vedic system of self realization Sanatana-dharma. To date Srila Maharaja has published more than eighty books in Hindu and over fifty in English and his followers have translated these into all the major languages of the world. Although he is presently 88 year of age, he continues to tour the globe providing insightful guidance and loving shelter to all the spiritual seekers who come to him. The Sanskrit word veda means ?embodiment of all knowledge, both spiritual and material?. The highest and most sublime wisdom is found in Vedic knowledge which has been passed down to modern times form the beginning of creation through an unbroken chain of self-realized spiritual masters and disciples. We learn from the great sages and saints of India that the transcendental literature called Srimad-Bhagavatam is the essence of all this timeless Vedic knowledge and it was manifested in this world by Sri Vyasadeva the literary incarnation of God Himself. The all-cognizant and fully independent source of creation maintenance, and destruction is described in the first verse of Srimad-Bhagavatam as Sri Krsna and that Supreme Absolute. Truth is present on each page of this great epic. The sages teach that Gopi gita is one of Srimad-Bhagavatam?s five most important chapters. We are therefore first presenting to respected reader the miraculous magical effect of reading or hearing Srimad-Bhagavatam and then we present the benefit of reading or hearing Gopi-gita. The glory of Srimad Bhagavatam is given in the Bhagavatam itself :< P> The material miseries of the living entity which are superfluous to him can be directly mitigated by the linking process of devotional service. But the mass of people do not know this and therefore the learned Vyasadeva compiled this Vedic literature which is in relation to the Supreme Truth. (Srimad Bhagavatam. Completely rejection all religious activities which are materially motivated, this Bhagavata Purana propounds the highest truth, which is understandable by those devotes who are fully pure in heart. The highest truth is reality distinguished from illusion for the welfare of all. Such Truth uproots the three fold miseries. This beautiful Bhagavatam, compiled by the great sage Vyasadeva (In his maturity), is sufficient in itself for God realization. What is the need of any other scripture? AS soon as one attentively and submissively hears the message of Bhagavatam, by this culture of knowledge the Supreme Lord is established within his heart, (Srimad-Bhagavatam 1.1.2). There are others who can hear about Krsna?s pastimes. They hear that krsna is playing His flute and that all human being animals, birds, and other creatures in Vrndavana are hearing his flute-song. As a result of listing to narrations of His pastimes these persons, too, develop the ambition to hear his flute. They will certainly give up all desire to taste the forms and qualities of the world. They will never want Svarga or even liberation from birth and death. The Sanskrit words gopi-gita mean the beautiful song of the gopis.? We learn from the ancient Vedic literature and from our lineage of spiritual masters that the gopis are the transcendental expansions of Sri Krsna?s inherent inconceivable power, His pleasure-giving potency, Sri Radha. It is by the influence of this internal power that the Absolute Truth Sri Krsan exists in four features: His personal fro as the supreme cause of all causes and supreme relisher of all transcendental mellows; His incarnations along with Their abodes and infinity of divine pastimes; all living entities; and the Unmanifest state of material nature. The function of the Supreme Lord?s own pleasure potency, in the form of his beloved gopis, is non different form His intrinsic form and nature. Thus the gopis are manifestations of his personal potency and also embodiments of the most elevated amorous mellow. Gopi-gita is sung by these very gopis and the magic of their song is praised in Srimad-Bhagavatam thus: ?When these gopis loudly chant the glories of Sri Krsna the vibration purifies the three worlds?. We pray that our readers will derive the greatest pleasure and benefit from Srila Bhaktivedanta Narayana Gosvami Maharaja?s discourse on this divine song. In the early 1990s, a small of sannyasis and other devotes were regularly visiting Srila Bhaktivedanta Narayana Gosvami Maharaja for guidance and instruction and instruction. Seated sometimes in his quarters in Vrndavana and sometimes in Mathura, Srila Maharaja answered their questions and explained to them the deep inner meaning of Srimad-Bhagavatam through the writings of our Gaudiya Vaisnava acaryas (spiritual masters). 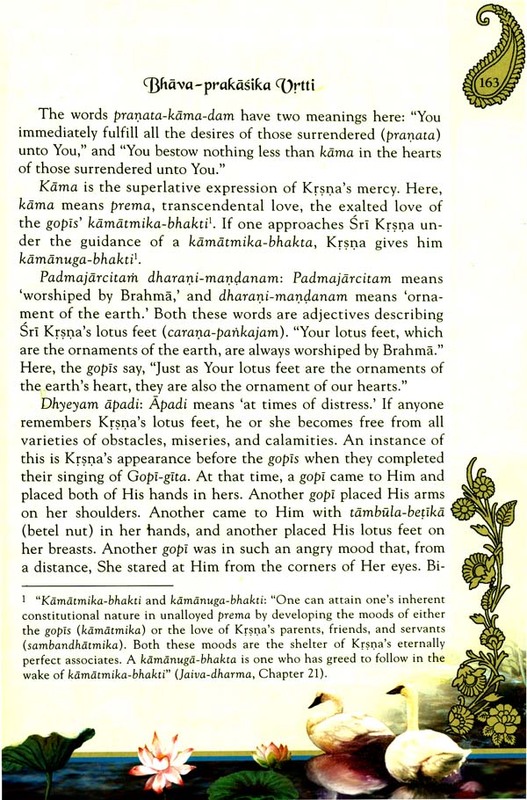 One of the main topics of discussion was Gopi-gita song of separation from Krsna, which they sang piteously after He had left the rasa-dance arena. Five thousand years ago the great sage Srila Sukadeva Gosvami mercifully revealed the gopis? divine song during his recitation of Srimad-Bhagavatam?s Canto Ten, Chapter Thirty-one. A most elevated sacred and confidential subject, Gopi-gita is far beyond the comprehension of conditioned souls. Therefore, with deep compassion, certain recipients of the gopis mercy have written commentary. Using that as a foundation Gosvami Maharaja explains, ?Sri Caitanya Mahaprabhu respected Srila Sridhara Svami?s commentary. Using that as a foundation, Srila Sridhara Gosvami established Mahaprabhu?s beautiful mood of Bhakti in his own commentary on Canto Ten. Srila Jiva Gosvami gave further light to that explanation as remnants, Srila Visvanatha Cakravarti Thakura extracted their ambrosial essence and composed his own. These acaryas commentaries were carefully handed down and taught by the self ?realized spiritual truths therein. Then in 1966, Srila Bhaktivedanta Swami Maharaja, famous throughout the world as Srila Prabhupada, carefully carried the ancient Vedic culture to the West. He did this for the purpose of creating a worldwide platform upon which the troubled people of this Iron Age of quarrel and hypocrisy could access these hidden truths. In his summary study of Canto Ten of Srimad-Bhagavatam, called Krsna, the Supreme Personality of Godhead he introduced the verses and commentaries of the gopis song in English and also translated over sixty volumes of Vedic literature. He did this in order to bring his worldwide audience to its gradual understanding. 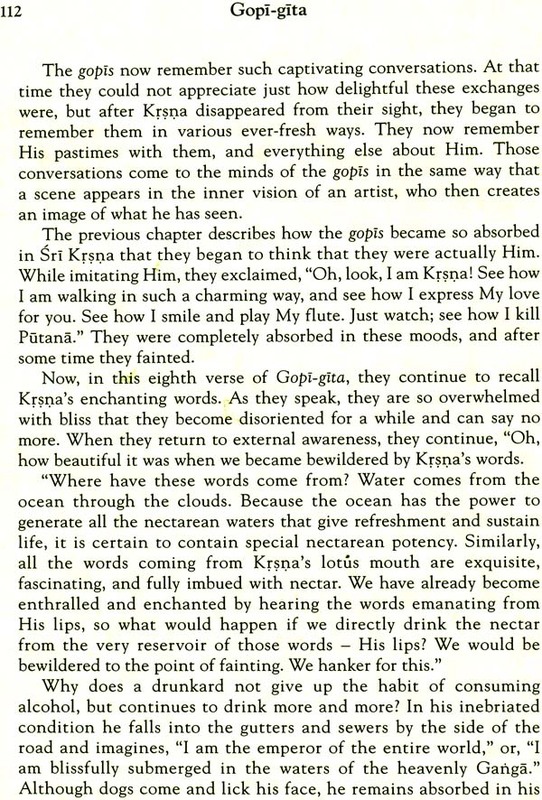 Then in order to further illuminate this divine topic, Srila Bhaktivedanta Narayana Gosvami Maharaja gave elaborate explanations of the acaryas contribution in his series of English discourses in the early 1990s. 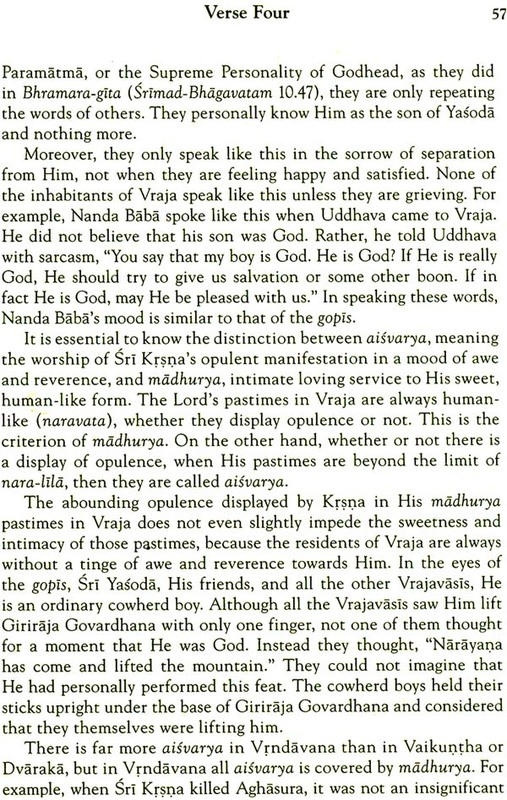 These discourses were unique because although Srila Narayana Gosvami Maharaja had previously spoken in Hindi on this subject to his senior students in Vrndavana and Mathura this was the first and only time he spoke about it so extensively in English. He stated in his discourse on Verse Two: ?Some of this explanation is from Srila Visvanatha Cakravarti Thakura?s commentary. There are also points that he has not explained and in those cases I have taken the explanation from Srila Jiva Gosvami?s commentary and also from my heart.? Srila Narayana Gosvami Maharaja?s English audience consisted of disciples of Srila Bhaktivedanta Swami Maharaja and he revealed something to them of his own service to their Gurudeva. I feel that I am serving him,? he told them. ?I feel this in my heart. Therefore I do not care for my own time. I take it as my bhajana-sadhana that I am helping you all. I pray that he will bestow his mercy upon me and that he will tell my Gurudeva also to bestow his mercy-because they were bosom friends.? When some of the devotees in his audience suggested that a book be compiled of his wonderful discourses he agreed and he added that although the book would be available to all people and everyone would benefit it would be especially precious to qualified persons. 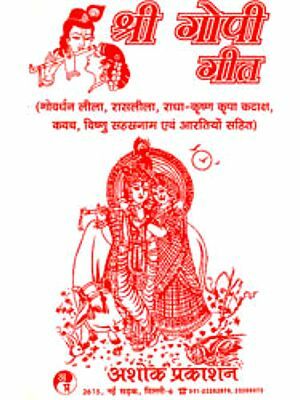 Several years later in 2005 while the editors were preparing the manuscript of his discourses, Srila Maharaja began his formal Hindi bhavanuvada translation of the Sanskrit commentaries of Srila Sridhara Svami, Srila Jiva Gosvami and Srila Visvanatha Cakravarti Thakura on Rasa-pancadhyayi. These five chapters, which describe Sri Krsna?s rasa dance and other related pastime with His gopi beloveds, are considered to be panca-prana, the five life-airs of Srimad-Bhagavatam. The editors had the fortune of being able to script of the commentaries of Gopi-gita, which is one of those five of his lectures. Srila Sridhara Svami?s commentary is entitled Bhavartha-dipika which means ?illuminations on the Inner Meanings of the Moods.? 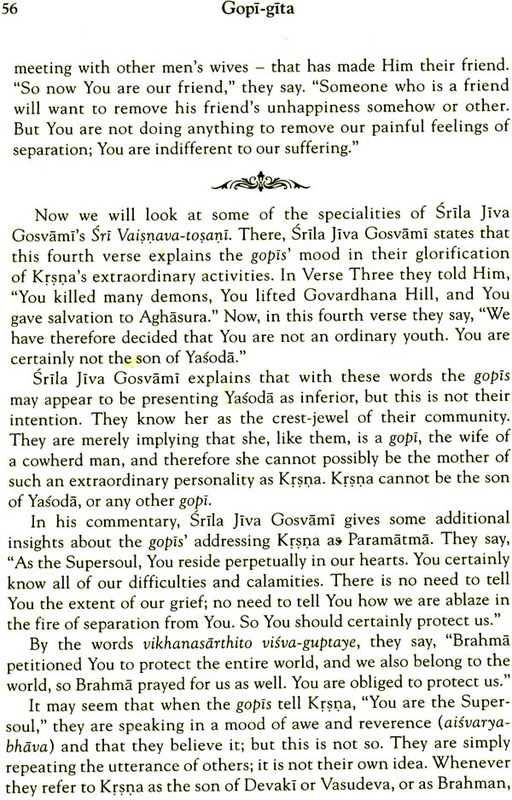 Srila Jiva Gosvami is the author of the Vaisnava ?tosani commentary which means ?Bringing Satisfaction to the Vaisnavas;? and Srila Visvanatha Cakravarti Thakura has given us Sarartha-darsini, meaning ?Revealing the Essential Meanings.? The editors asked Srila Narayana Gosvami Maharaja of he would kindly give a name to the written form of his own discourse, his spoken commentary, and he named it Bhava-prakasika Vrtti, meaning ?The Commentary That Illuminated the mood. Srila Maharaja has used many Sanskrit terms in hi commentary which are usually explained in English either in the text or in a foot-note. Where you find the explanation insufficient, you are invited to turn to the glossary. Where a footnote does not include a specific reference cite, it has usually been taken from one of the glossaries of Srila Maharaja?s other books. Following the tradition of our spiritual preceptors we use standard diacritical markings to indicate the pronunciation of the Sanskrit words. Pronoune a like a in father, I like ea in neat, u like oo in root, r like ri rip m and n like ng in hung, s and s like sh in shy and c like ch in chap. Attached to the inside back cover you will find a CD of Srila Maharaja singing the nineteen verses of Gopi-gita as well as the first two verses of the next chapter that describe Sri Krsna reappearing to the gopis. 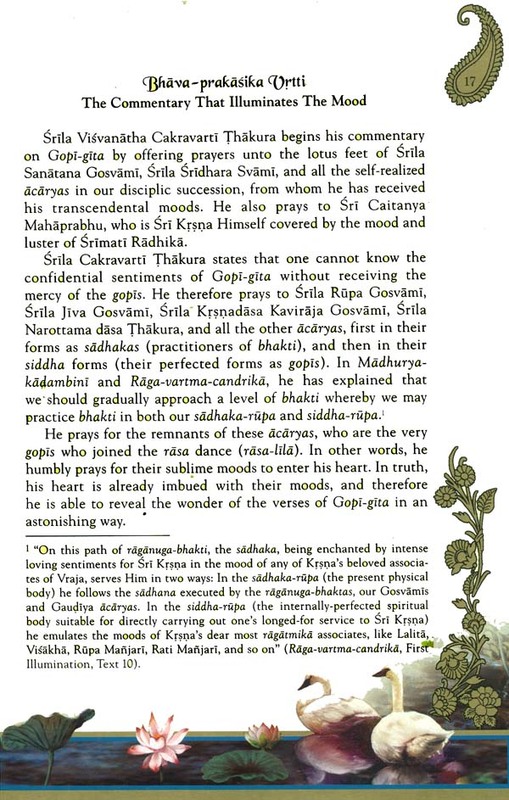 The CD also contains Srila Maharaja?s Hindi introduction to these Gopi-gita verse the translation of which is given in the accompanying CD-booklet. Finally the CD also contains two audio lectures given by Srila Maharaja in Englsih which elaborate on some of the pastimes and philosophical truths surrounding Gopi-gita. We humbly beg you to forgive any mistakes made by us in compiling Srila Bhaktivedanta Narayana Gosvami?s Maharaja?s Presentation. Upon Seeking Krsna dancing with all the other gopis and at the same time dancing left the rasa dance in a sulky mood. Gopi-gita is part of rasa-panca ?adhyayi, the five chapters of Srimad-Bhagavatam that relate rasa lila. The body has five kinds of life-airs (panca-prana), residing in the heart, and among these five, one is most vital. The twelve cantos of Srimad-Bhagavatam are likened to twelve parts of a body. The tenth canto is the heart of that body, within that heart the five chapters that constitute rasa-panca-adhyayi are its five life-airs and, among them, Gopi-gita is the foremost. We begin our discussion of Gopi-gita by remembering the chapter in Srimad-Bhagavatam that describes the gopis? worship of the goddess Katyayani-devi to attain Krsna as their husband. The first verse of this chapter states. During the first month of the winter season, the young unmarried girls of Gokula observed the vow of worshiping goddess Katyayani. For the entire month they are only unspiced khichri. The gopis who observed the vow to worship Katyayani were young and unmarried. What then was Sri Krsna?s age at this time? Krsna had left Gokula at the age of three and a half. According to Srila Vyasadeva and Srila Sukadeva Goswami, He was seven years old when He lifted the mountain, Giriraja Govardhana, on the little finger of His left hand. After he lifted Giriraja al the elders and their priests gathered together and told Nanda Baba, ?You should not Treat Krsna as if He were your son. He is actually not your son. He may be a demi-god or perhaps He is God, or someone like God. We have heard that Narayana Himself has come in the form of Krsna, and perhaps it is true. So you should not treat Him like an ordinary boy. Do not bind His hands, and do not chastise or punish Him. He is only seven years old and yet He lifted a mountain like Govardhana. How is that possible? This is indeed mysterious. ?Oh,? Nanda Baba laughed. ?I have heard that gopas only become mature and intelligent at the age of eighty. They cannot properly decide anything before then, because their minds are not fixed. Krsna is just an ordinary boy. ?God has far more good qualities than even the perfected saints. Such saints do not become angry, and they are not disturbed by hunger, thirst or any other material distress. They do not steal or tell lies. ?Krsna tells lies. He weeps and becomes angry. He plays tricks on people, and he is naughty in so many other ways. He sometimes cries for butter and sugar candy. If he does not get what He wants, he becomes furious and hurls all the items in our home onto the ground, and then scatters them here and there. ?This is conclusive proof that He is not God. In any case even if you would insist that He is God, He is still my son, so I will admonish and punish Him and treat Him as a father should treat his child.? Nanda Baba continued to laugh at the notion that Krsna is God; then Yogamaya came, and by her influence, everyone present forgot this idea. This incident tool place during month of Kartika, when Sri Krsna was seven years old and it was just after Kartika that the gopis worshiped Katyayani. There were two groups of gopis married and unmarried. Although it was the unmarried gopis who worshiped Katyayani, the married gopis like Lalita, Viskha, and Srimati Radhika also had purva-raga (the gopis? tender love for Krsna before their first intimate meeting with Him).This is because although they had met with Him so many times, they always felt the excited anticipation of a first meeting. The unmarried gopis were somewhat younger than the married gopis. Srimati Radhika is thirteen and a half years old, and Krsna is fourteen. Lalita is twenty-seven days older than Srimati-Radhika, and Visakha was born on the same day as Radhika. Rupa Manjari and Rati Manjari are a little over twelve years, so they are about one and a half years younger than Krsna. This means that when Krsna was seven years old, the gopis who were engaged in the worship affection for him. Their love for Krsna was not kama, amorous affection, because kama is not possible at such an age. They loved Him deeply, but without kama. Krsna told those gopis engaged in worship, ?Next year, during the autumn season, I will fulfill your desires. ?Then, a year later when Krsna was about eight years old, He played His flute to call the gopis to the rasa dance. It is said that krsna was in Vrndavana until He was ten years old, and within that time He performed rasa-lila as well as all His Vrndavana pastimes. In order words, He appeared to be fourteen years old when He was actually only ten, and the gopis also appeared to be older than they were. Speaking in a humorous mood, typical of the playful nature of a maidservant of Srimati Radhika, Srila Visvanatha Cakravarti Thakura has said that they grew up very quickly because they used to eat so much butter and sugar candy. In actual fact, the reason they appeared to be teenagers is because of the influence of Yogamaya. In their previous births some of the young unmarried gopis had been personified Vedic scriptures called srutis, and they are known as Sruti-cari gopis. Some had been personified Upanisads, and are known as upanisad-cari. Some had been sages from the Dandakaranya forest (Dandakaranya-rasis), some had been princesses (raja-kumaris) from Janaka-puri, and some, daughters of the demigods (deva-kanya). 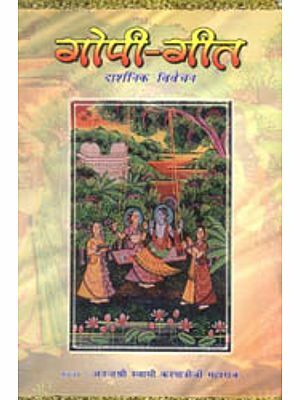 Among the gopis some had the association of the Nitya-Siddha gopis and also had purva-raga. These gopis easily entered the rasa-lila whether they were married or not. [The unmarried gopis were already betrothed and therefore they also thought of Krsna as their beloved in a paramour mood.] On the other hand, the married gopis who had purva-raga but did not have the association of Nitya-Siddha gopis were stopped from entering. The gopis described in the above mentioned verse from Srimad-Bhagavatam (10.22.1) had association with the Nitya-Siddha gopis. We know this because at the end of the month they invited Radhika, Lalita, Visakha, Citra, and all other such gopis to join then in their worship. This means that they had association of those gopis and consequently they could easily enter the rasa dance. This is confirmed in the Srimad-Bhagavatam. The Nitya-Siddha gopis and those who had their association entered the rasa-lila without difficulty, whereas the married gopis with sons or daughters were checked by Yogamaya. Even thought they had purva ?raga, they could not go. It appeared that it was their husbands who had obstructed them, but actually it was Yogamaya who did so. She had entered the minds of their husbands who had obstructed them; out actually it was Yogamaya who did so. She had entered the minds of their husbands, fathers, mothers, and other relatives influencing them to prevent the gopis from going. If Yogamaya had wanted them to join the rasa-lila, she would have made duplicate forms of those gopis. In this way the real gopis would have been able to leave their homes unnoticed and enter rasa-lila. However she could not help these gopis, because they had some traces of a consciousness that was not favorable for fully developed paramour love in relationship to Krsna (parakiya-bhava). They still had the conception: ?This is my husband, and these are my children.? Their affection was not solely for Krsna but was shared with many others. We are now beginning the devotional process. If our eternal spiritual form is that of a gopi, we will develop an increasing taste to serve as a gopi. We will gradually be able to perform Sadhana like Srila Rupa Gosvami and Srila Raghunatha dasa Gosvami, and in this way we will develop a yeaning to be like the gopis. Now in our present situation, by reading books on this subject, we must clearly define our goal. Success is sure if, as we read and remember, we long to attain that goal: ?I must have that mood one day. I will not accept any other goal.? We must be completely uncompromising, not accepting any other goal no matter who offers it. We should think, ?Even if Krsna Himself comes and wants to offer me an alternative goal, I will not accept it.? Who can be so determined? Only those with the Svarupa (intrinsic spiritual natire of a gopi can act in this way. Almost all the associates of Sri Caitanya Mahaprabhu have this kind of Svarupa, although there are a few exceptions such as Murari Gupta, who is hanuman in the pastimes of Lord Sri Ramacandra, and Anupama, another eternal associate of Sri Rama. Hanuman and other elevated associated whose Svarupa is different from that of the gopis have no taste for this subject matter, even if they hear about it. This same is true of Srila Haridasa Thakura, because he was Brahma. According to the descriptions of his character in the pastimes of Sri Caitanya Mahaprabhu, his Svarupa was not that of a gopi. Braham is the original guru in our sampradaya. In the tenth canto, fourteenth chapter of Srimad-Bhagavatam he prayed to attain the dust from the lotus feet of the Vrajavasis, but he did not state clearly that it should be the gopis? lotus foot-dust. Uddhava, on the other hand specifically prayed for the dust of the gopis feet. We see in Brahma-Samhita that Brahma performed worship by means of both the gopala-mantra and kama-gayatri, but that was only to gain power for creation, not to attain gopi-prema. One year after Krsna made His promise to the gopis on the full-moon night in autumn He looked at the moon and began to play His flute. He considered, ?Our forefather, the moon, has a beloved other than wife, Rohini. His beloved is Purva-disa, the eastern horizon. Krsna was thinking, ?The hands of our forefather the moon are smeared with kumkum. Those hands his rays are decorating the face of his beloved Purva-disa without any difficulty and she is shyly accepting that reddish ornamentation. Why should I not do the same? In other ambrosial atmosphere thoughts of the gopis came to Krsna?s mind and He remembered His promise to fulfill their innermost desires. He pondered, ?By diffusing the reddish hue of his gentle rays and by glowing with effulgence of newly applied vermilion, Candra (the moon) had reminded me of my promise and has applied within My heart the inspiration to fulfill it. This is the perfect moment for me to do so.? Then on that full moon night of the autumn season, he played a beautiful melody on His flute and the gopis came running to Him. But when they arrived, he told them to return to Vraja.? A lady should serve her husband may be poor or plagued with diseases, but she should serve him under all circumstances. At first the gopis did not say anything in reply, but within their minds and hearts they questioned, ?Does he really mean it or is he joking with us?? They observed Him closely as he tried to cleverly hide his real intention. It seemed that he was honestly expressing Himself in a straightforward manner, but in but in fact, he was not. Finally the gopis said, ?you are out guru and as such you are giving us so many instructions. We know that even in the presence of God, a person should serve his Gurudeva first, so let us first serve you, our Gurudev, before we return to serve our husbands.? 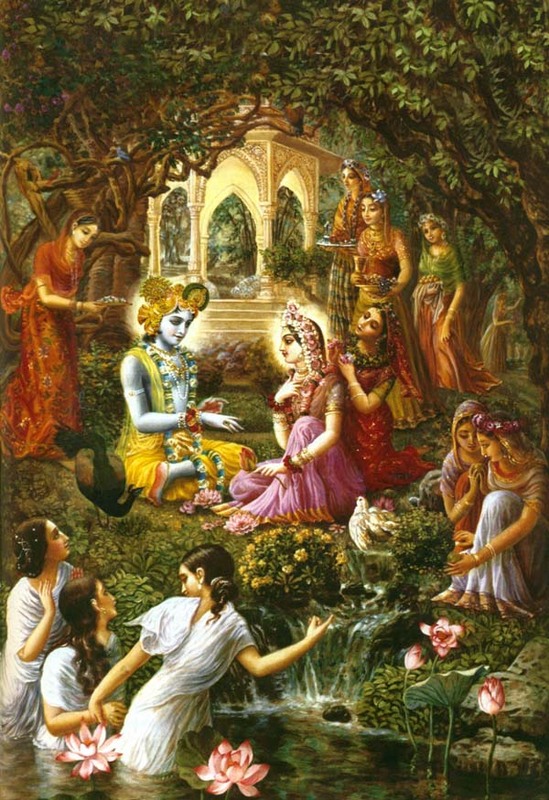 Sri Krsna was instructing the gopis and also telling them, ?I am God so you should obey me?. The gopis replied, ?We agree that if you are God we should certainly obey you, but our first duty is to serve our Gurudeva. When we have executed that order, we will obey Your instructions to serve our husbands. ?Our seconds consideration is this. We know that God is our father, God is our father, God is our real husband and God is everything; so if you are God then you are both our husband and our guru. In every way, if You do not accept our service you will be guilty of acting against the principles of religion. You are giving us instructions on religious principles, but You should practice this yourself.? 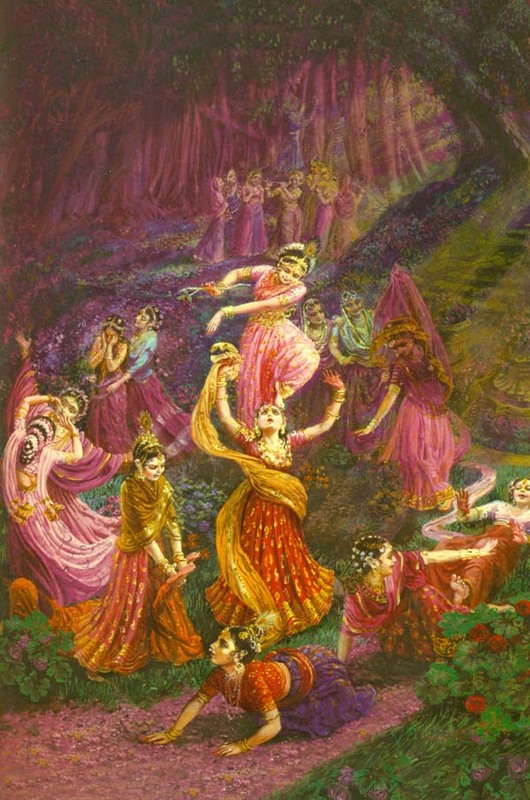 At lest, rasa began, Krsna danced with Srimati Radhika in the center of the circle of gopis, and at the same time He danced with each of the gopis comprising the circle. It is not that he expanded into as many manifestations of Himself as there were gopis, because in Vrndavana, all His pastimes are free from the mood of opulence (aisvarya). Rather, He danced so quickly, like a firebrand orbiting in a circle that it simply looked as of he were constantly and simultaneously dancing with each and every gopi. Had he expanded into many manifestations of Himself, this pastime would have been aisvarya-lila. Instead, He was engaged in human-like pastimes (nara-lila). Many commentators have written that Krsna manifested His kaya-vyuha, direct expansions of his personal form, when He was dancing this is not so. He refutes the idea that the expansions of Krsna?s form performed this pastime, asserting that if His expansions had done so, it would be a lila of Vaikuntha. He explains that in fact, only Krsna?s original form (Svayam-rupa) performed this transcendental pastime. We thus conclude that Krsna moved liked a lighting flash form gopi, dancing with each one in turn. Srimati Radhika saw dancing with each; she saw that krsna was dancing with each of them as well. Each gopi thought ?Krsna is dancing only with me. ?Srimati Radhika alone could see Him with each and every gopi. Krsna?s performance of rasa-lila in this way- manifesting no aisvarya by bringing forth expansions of His form, but in fact whirling from gopi to gopi-was certainly miraculous. Moreover, He performed many varieties of activities with the gopis as danced together. He asked one gopi if she were fatigued, He gently wiped drops of perspiration from the face of another, and He fastened ankle-bells on the ankles of another. 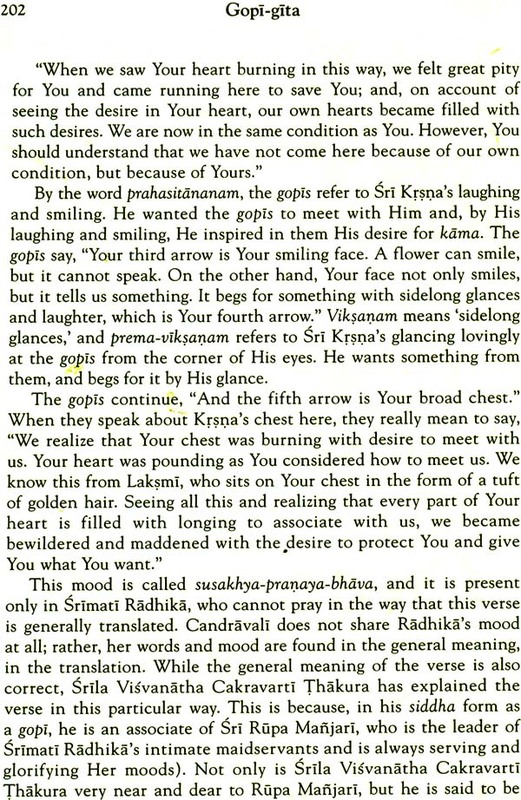 With each and every gopi He engaged in various interactions, and thus each gopi become maddened in their love for him. It is stated here that the gopis as an entire group exhibited both Saubhagya-mada and mana. However, if we take a closer look at the meaning it becomes apparent the mana was only exhibited by Srimati Radhika. Only she could see krsna dancing with the other gopis. The other gopis do not see this, and thus they were intoxicated by their good fortune in which they perceive Krsna dancing with them alone. When a hero (nayaka) is controlled by a heroine (nayika), the heroine thins herself to be the most fortunate beloved. This fortune is called saubhaga and as it evolves, it brings her to saubhagya-mada means intoxication from the pride of thinking, ?in all of Vraja there is no one equal to me in good fortune. In this state, the gopis become so proud that if they had been aware of Krsna?s dancing with other gopis, they would have been completely unable, each gopi was convinced that she had Krsna fully under her control, tht was captivated and controlled by her and obedient to her every command. Krsna understood this and considered, ?I have decided to sport with all the gopis and fulfill all their most cherished desires, but there is no hope of that happening unless they change their mood. Somehow their pride nust be removed. He then saw that Radhika was no longer there in rasa-lila. In Her mana, she had abruptly left that place and was going elsewhere. Then, suddenly Krsna also disappeared, and all of the gopis began their search for him. 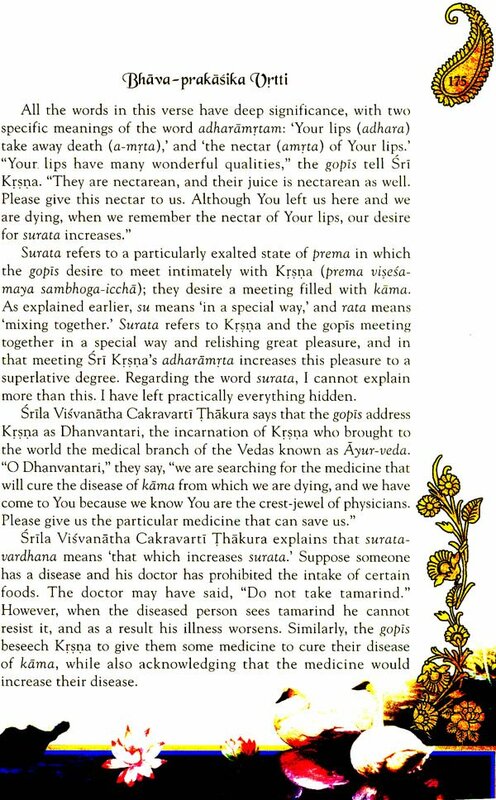 Some commentators say that krsna become invisible but Srila Visvanatha Cakravarti Thakura explains that He did not. Rather, He went to a nearby kunja and hid there. There were four kinds of gopis present in the rasa-lila on the bank of Yamuna: svapaksa, those in Radhika?s own (sva) group (paksa) vipaksa, those in the rival group of Candravali; suhrd-paksa, those who are neutral to her party. actually, svapaksa can refer to either Radhika?s group pr Candravli?s group. For those in Radhika?s group, Candravali is vipaksa and for those in Candravali?s group, Radhika is vipaksa. Syamala is friendly toward Radhika which means she is neutral to Candravali. Bhadra on the other hand, is friendly toward Candravali and neutral to Radha. Within these four main groups of gopis, these were hundreds upon hundreds of sub-categories, and all were searching for Krsna. The gopis in Radha?s group could not see their yuthesavari (group-leader), Sri Radha, so they were searching only for Krsna. Srimad-Bhagavatam?s Canto Ten, Chapter Thirty describes the gopis? search for krsna, and how they all become tadatmika with Him. This means they become so absorbed in remembering His characteristics such as the way he walked and how sweetly He talked, that they began to think that theu themselves were Him. The gopis become like mad persons, asking the tress, creepers, rivers deer and peacock if they had seen krsna. They asked the Tulasi plant, but when Tulasi did not respond, the gopis thought, ?Oh, Krsna has warned her not to tell us where he is and because she is his beloved she refuses to utter a word.? They asked the trees, but when they did not reply the gopis thought, ?These trees are male and therefore they are Krsna?s friends. He has no doubt told them not to tell us where he is. This is why they are remaining silent.? When the gopis saw the creepers laden with flowers, they thought, ?Krsna has touched these beautiful creepers with His fingers, and now they are so happy that they have no awareness of anything external. They cannot speak because they have been taken leave of their external senses altogether.? At first the gopis concluded that krsna was not to be found anywhere and that He would not return to them. They were somewhat consoled, however when they finally noted His footprints. They followed His footprints for some distance for some distance until, to their surprise they saw another set of footprints.